Contrast is a significant feature of the baroque era: for instance the contrast between dark and shadow in paintings dating from that era. The contrast between sin and forgiveness and between the misery of life on earth and the joy of life in heaven are recurrent elements in sacred music. That is certainly the case in Bach's cantatas. The present disc includes three cantatas which attest to that. The first two were written for the same Sunday of the ecclesiastical year: Sunday Jubilate, shortly after Easter. Bach composed three cantatas for this Sunday which belong to his better-known works: apart from the two performed here there’s also Weinen, Klagen, Sorgen, Zagen (BWV 12) which inspired Franz Liszt to an arrangement of the first chorus. The first recitative from this cantata has the same text as the first chorus of Cantata 146: "We must through much tribulation enter into the Kingdom of God". Thematically the cantatas for Sunday Jubilate refer to the gospel reading which are the verses 16 to 23 from the 16th chapter of the Gospel of John. The key is verse 20 which is also the text of the opening chorus of Cantata 103: "You shall weep and lament, but the world shall rejoice. Now you shall be sorrowful, yet your sorrow shall be turned into joy". This is reflected in the texture of the two cantatas: they begin with a desciption of the sorrow of the faithful, but halfway they turn into an expression of the joy which awaits them. Wir müssen durch viel Trübsal opens with a sinfonia with a part for obbligato organ which is the opening of a lost violin concerto only known in a later arrangement for harpsichord (BWV 1052). The second part of this concerto is used in the chorus; again the organ has an obbligato part. This chorus includes strong dissonants, expressing the meaning of the text. Next follows a long aria for alto, and once again the organ plays an obbligato part. In one manuscript this part is given to the violin - that is also indicated in the lyrics in the booklet, although here the part is played by the organ - but that indication seems not to be in Bach's hand. In baroque music strong emotions are often expressed in an accompanied recitative as the strings allow the possibility of creating harmonies which depict the sorrowful state of the protagonist. That is also the case here as the tenor dwells on the "wicked world" and longs for a life with Jesus in heaven. The turning point is in the next aria for soprano: "I sow my tears with an anxious heart. Yet my heart's suffering shall reap glory for me on the day of the blessed harvest". After a secco recitative for tenor he is joined by the bass for a duet in triple time which expresses the joy of the "heavenly, blessed delight". The chorale has no text in the extant manuscript. Several suggestions have been made. The tracklist says: 'Denn wer selig dahin fähret' or 'Ach, ich habe schon erblicket'. That in itself is quite odd: apparently the tracklist has been copied from some book. One would expect it to indicate what is actually sung. Here a more recent suggestion has been followed: the first stanza from the hymn 'Freu dich sehr, o meine Seele'. This cantata is the third for Sunday Jubilate and must have been written between 1726 and 1728. Ihr werdet weinen und heulen was written for 22 April 1725, and was the first in which Bach used texts by Marianne von Ziegler. However, he did alter them: the second recitative is abridged. The opening chorus attests to the preference for contrast in the baroque era: the elements of sorrow and joy are strongly juxtaposed through the use of contrasting musical material and opposing textures: for instance the sudden turn from a choral fugue to a recitative for bass. As one would expect Bach makes use of chromaticism to expose the sorrow to which the text refers. Bach requires a flauto piccolo, a soprano recorder in d''. It returns in the alto aria 'Kein Arzt ist außer dir zu finden'. Bach later rewrote this part for transverse flute or violin. It is quite odd that here a recorder is used in the opening chorus, but a transverse flute in the aria. That seems untenable from a historical angle. This cantata also begins with an exposition of the sorrow of the believer. In the alto aria the protagonist asks: "Who will heal the wounds of my sins?" The turning point is the following recitative, again for alto: "I trust your promised word that my sorrow shall be turned into joy". "Recover, distressed minds" is the opening of the tenor aria; the orchestra includes a part for trumpet which also participates in the closing chorale. Allein zu dir, Herr Jesu Christ was first performed on 3 September 1724, the 13th Sunday after Trinity. It is a chorale cantata; the opening chorus and the closing chorale are the first and fourth stanza respectively from the hymn by Konrad Hubert (1540). The two recitative and aria pairs in between are paraphrases of the second and third stanzas. There is hardly any connection between the text of the cantata and the readings of the day. 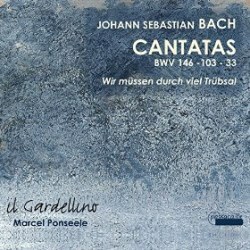 In his book The Cantatas of J.S. Bach the German scholar Alfred Dürr suggests a connection in the reference to neighbourly love in the duet: "Grant that out of pure impulse I love my neighbour as myself". This is also the subject of the gospel reading of this Sunday: the parable of the Good Samaritan (Luke 10). In this cantata the contrast is between sin and forgiveness. In the first recitative the bass sings that "my sin is heavy and very great". It is followed by an aria in which the alto and the obbligato violin - playing with mute - eloquently express "how fearfully my steps wavered". The steps are depicted by the pizzicato of the second violin, viola and basso continuo. The figures in the violin are connected to the text and that explains why they are omitted in the B part: "Yet Jesus' word of comfort reassures me that he has done enough for me". The duet is in a lively tempo, and the two voices largely move in parallel thirds and sixths. There is a strong similarity with the duet in Cantata 146, although here it is more polyphonic in texture than the other duet which is largely homophonic. The tutti are performed by the soloists with additional ripienists. According to Joshua Rifkin and Andrew Parrott Bach performed most of his sacred works with one voice per part which means that the soloists also sang the tutti. In some cases there is evidence of the use of ripienists. I don't know whether that also goes for the cantatas performed here. The liner-notes ignore the issue. The tutti parts are very well performed, and that includes the chorales, which are often a weak spot in recordings of Bach's sacred music. The soloists are excellent, without exception. Only in some cases did I feel that there was a lack of depth, for instance in the tenor aria 'Erholet euch, betrübte Sinnen' (BWV 103), sung by Reinoud Van Mechelen, whose voice I like very much. I find Marcus Ullmann's voice less attractive, but he gives a good account of himself. Lieven Termont has no arias, but participates in the two duets and sings his recitatives in an expressive manner. Margot Oitzinger sings the long aria from BWV 146 beautifully, but the lowest notes are rather weak, especially considering the presence of the organ. This is an Italian instrument and produces a sound which is a bit too penetrating. A mellower sound would have been preferable. Damien Guillon is one of the best Bach interpreters of our time, who works regularly with Philippe Herreweghe. 'Wie furchtsam wankten meine Schritte' (BWV 33) is one of the highlights of this disc. Despite the odd decision in regard to the scoring in Cantata 103 this is a very fine disc with generally outstanding performances of three of Bach's most expressive cantatas. It is the shame that the booklet is not up to the same standard: apart from the issues I mentioned it includes several printing errors. It is a shame that such a fine disc is accompanied by such a booklet.